We support and work to enact Pennsylvania House Bill 1450, introduced by Representative Mark Cohen (D), which will provide unmarked driver’s licenses for undocumented Pennsylvanians. The bill is currently in the Transportation Committee of the Pennsylvania House of Representatives. We are fighting for unmarked driver’s licenses, meaning a driver’s license that looks the same as Pennsylvania citizens. It is critical that the licenses are unmarked so that the driver is not immediately identifiable as undocumented, which could threaten their safety. Immigrants help Pennsylvania grow economically, culturally, and socially by building businesses, working in critical economic sectors, paying taxes, and bringing life and culture to our communities. Providing unmarked driver’s license is critical to expanding opportunities for immigrants in Pennsylvania, as well as improving the safety and economy of all in the Commonwealth. Twelve states in the U.S. already provide driver’s licenses to undocumented people. We call on Pennsylvanian elected officials to follow the example of Washington state to offer an unmarked driver’s licenses for all. Through strategy led by our immigrant leaders, all of our immigrant congregations are organizing to win driver’s licenses for all. It is a challenging campaign, as Pennsylvania is a large and conservative state driver’s license committee. Despite this, we know we will prevail and win this common-sense legislation that supports immigrant families, public safety, and Pennsylvania’s economy! The Alianza Pro Licencias PA (Alliance for Licenses PA) is a Pennsylvania-wide coalition organizing for driver’s licenses for all. New Sanctuary Movement of Philadelphia works in conjunction with Lucha Pro Licencias PA , Make the Road Pennsylvania, and CASA. We have regular meetings to discuss and implement strategy and build unity in Pennsylvania for driver’s licenses and immigrant power. 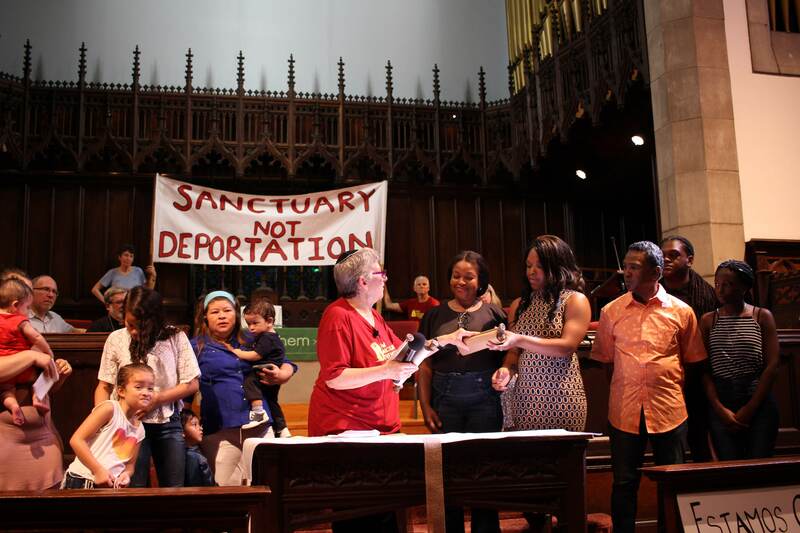 We at the Alianza prioritize and value leadership from the immigrant community. We open our doors to any immigrant and allied community who wants to get involved because we believe strength lies in diversity. The Alianza is committed to working with effective, accountable, transparent, and respectful communication. We share work, ideas, and opinions about each step of the campaign to make successful, strategic, and democratic decisions. We are committed to fulfilling all of our work goals because we know we work for all immigrant communities in Pennsylvania. We support and include all communities regardless of race, country of origin, language, immigration status, social class, gender, age, or criminal history. We believe in second chances. We appreciate taking chances without fear of making mistakes and take responsibility and maintain open minds to learn from mistakes. We promote faith in the divine, in our communities, leaders and team work. We work with humility, integrity, commitment and responsibility to support each other in a supportive, respectful, and inclusive manner.